BH Lisas Boy, under jockey Cesar DeAlba, earned his second Grade 1 win of the season in Saturday's Bank of America Challenge Championship. LOS ALAMITOS, CA—NOVEMBER 17, 2018—BH Lisas Boy, a homebred 6-year-old Mighty Invictus gelding owned and trained by Bill Hoburg of Kennewick, Washington, parlayed a sharp break from post 4 into a one-length victory in Saturday's $250,000 Bank of America Challenge Championship (G1) at Los Alamitos. 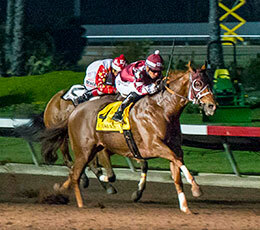 Under jockey Cesar DeAlba, BH Lisas Boy went 440 yards in :21.506. In addition to posting a 98 speed index, BH Lisas Boy banked the $112,500 winner's share of the purse from his fourth lifetime Grade 1 win. BH Lisa Boy was sent to post a the 5-2 second choice in the field of 11, and he was rebounding off of his eighth-place finish, 2 3/4 lengths behind winner He Looks Hot, in the Grade 1, 440-yard Robert Boniface Los Alamitos Invitational Championship on October 14. BH Lisa Boy has won 20 of 35 starts, including 11 of 20 at Los Alamitos and five of 10 at the quarter-mile trip, and he has earned $697,662. He is out of the Snowbound(TB) mare Apollo Snowbound. Earlier this year, he scored a neck victory in the Brad McKinzie Winter Championship (G1). 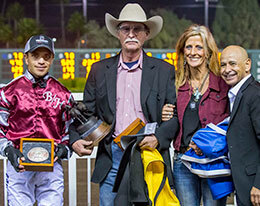 Triple Crown jockey Mike Smith presents winning trainer/owner Bill Hoburg and jockey Cesar DeAlba the Bank of America Challenge Championship stakes trophy. The Bank of America Challenge Championship(G1) victory also garnered him a starting spot in next months Grade 1 $600,000 Champion of Champions at Los Alamtios. Katies Easy Moves earned $50,000 for his second-place effort, bringing his earnings total to $172,408. Monty Arrossa trains the Maknmoves Utah-bred for owner O-So-Smart LLC. Bred by Walter L J Finder, Katies Easy Moves is out of Katie Lane Finder by Lanes Leinster. Trainer Jason Olmstead saddled third-place finisher Kowboy Jim for owner/breeder Dean Frey. The FDD Dynasty 4-year-old from the Mr Jess Perry mare Counting On You earned $25,00 for the effort to boost his bankroll past $165,000. Champion jockey Cody Jensen was in the saddle. The 7-5 favorite champion Hold Air Hostage was fourth followed by Jess A Cowboy, Bout Tree Fiddy, Corona B Gone, Flyingforunclesam, Faster Than Hasta, Arizona Icon, and Corona Jumpim MRL.